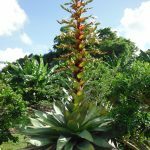 The Imperial Bromeliad (Alcantarea imperialis) - Richard Lyons Nursery, Inc.
Alcantarea imperialis is endemic to Brazil and is one of the largest terrestrial bromeliads. Its leaf color is very variable, ranging from all green to deep purple and various combinations in between. 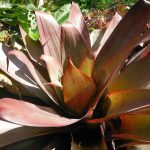 You may recognize this bromeliad as Vriesea imperialis, its former botanic name. At 5′ across it can take up to ten years to attain this size. 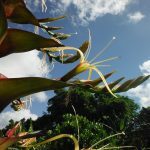 The flower spike is also of a spectacular size as it can reach upwards of 6-8′ and flower for 5 months or more. 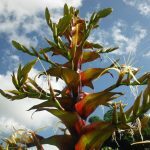 The spike can produce 400-600 flowers for the potential of 80,000-200,000 seeds. 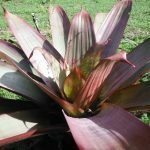 As with all bromeliads, once the plant flowers, the main plant dies and pups or offsets are produced along the base of the dying plant to begin the process all over again. Richard Lyons’ Nursery sells these bromeliads in 15 gallon containers.